The problem is, while it was fun for me in the moment, I knew it would not be for everyone. There can always be a few who are injured or lose their lives or loved ones. I knew the quake that woke me up would be bad enough to worry about others, even though it was not bad enough to worry about myself. It woke me up, after all. And it continued after I was wide awake. But there was nothing I could do. I didn’t hear any loud crashes. So, I checked outside to make sure no scooters needed to be picked back up. None did. So, I went back to sleep. The next morning, the stories came in. A mirror had fallen off a friend’s wall, landed on the arm of a davenport, and didn’t break. Four inches of water had slopped out of a fish tank, shutting off the cable box next to it. The family used a hairdryer and the box started working again. A lady had been cooking (at 4:00am) and panicked as she saw her poured flexcrete hallway snaking back and forth. She ran and hit her arm. That was the worst. Had she sat down, she would have been fine. But for those on Yongda Road, 15 minutes away, they couldn’t have saved themselves even if they had run. 100 missing. 15 confirmed dead. The building fell at an intersection where I have many former students. When they heard the crash they were struck speechless. They might have been able to do something. Security alarms had already notified the police. If they went into a recently fallen building, they could cause more problems. In that moment, there is nothing to do. Most people fear. Once I calculate a tremor to be safe, I might as well make the most of things and enjoy it. 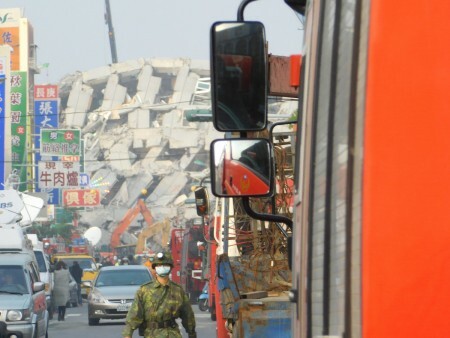 Fear and thrill is a well-kept secret about earthquakes. Another secret is, actually, stuff that you think would fall doesn’t actually fall. It’s almost an argument for the plasma-universe over gravity as our metaphysical fabric. But, I digress. Fewer things break than should. Of course nothing fell over in my apartment. And, of course, I was just fine. That’s how it usually goes for nearly everyone involved. Earthquakes are similar to thunder and lightning. First, there is a simple up-and-down jolt—the “P-wave” (primary). Then, like thunder after the lightning, depending on how far away you are from the epicenter, the “S-wave” (secondary) comes. Everything wobbles back and forth. And, that is when the damage is done. P-waves aren’t felt as far away as the S-wave. So, if you feel that up-and-down jolt, that’s your one-second warning. It usually isn’t enough to wake you up. The S-wave is always bigger. What can you do in one second? Grab your drink. Stabilize your computer monitor or TV. Get clear of any tall bookshelves. If that isn’t enough to save you then you’re gonna’ die anyway. If you end up in a pile of rubble for 12 hours, like some did, it’s better to have fewer things broken when you’re crawling around in the dark. The most recent professional advice is, more or less: just stay put. That’s what the lady in the hallway should have done anyway. Simple as it seems, contrary to ever-changing professional advice as it may be, after the first shake, I grab my drink and pray. I don’t need to worry about bookshelves because I don’t put them close to where I work or sleep. But the best way to keep yourself safe in an earthquake is preparation. Don’t stack stuff too high. Anything can wobble, even without an earthquake. Most of all, follow the building code. 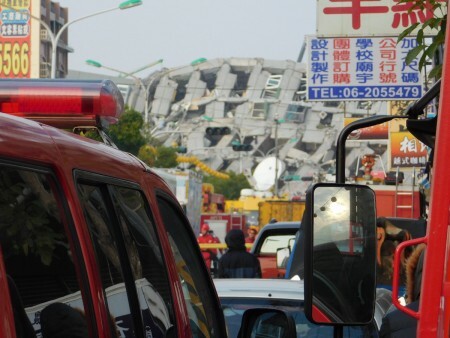 Nearly all Taiwanese buildings are earthquake-proof bomb shelters. Technically, Taiwan is at war with China, going back to the Communist revolution days. Buildings, houses, offices—they are usually poured, flexible cement (flexcrete), with lots of re-rods. Most buildings can withstand a 6.7 and you can still drop a bomb on them. 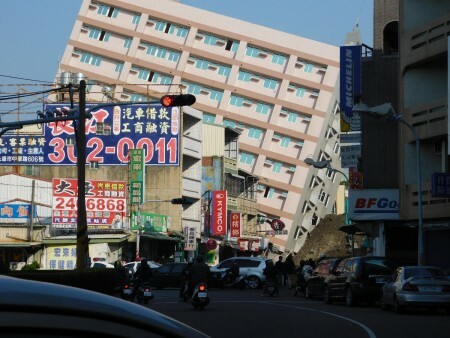 So, when one of those buildings falls over, it’s not normal. Nothing needed to fall over in this earthquake. I’ve spoken with a friend who has a background in civil engineering and a professor with a PhD in material science about this. I’ve also seen some of the reports on local news. 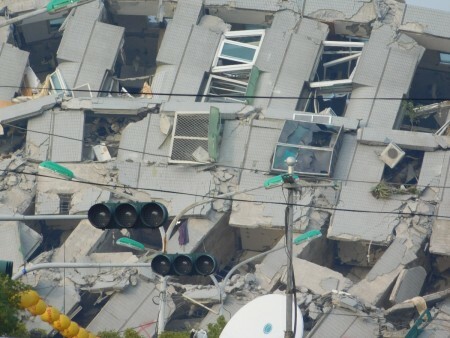 Taiwan is an island of engineers and technicians who are now looking at their televisions (if not right out their windows) to see re-rods sticking out of the main buckling points in these piles of rubble. They have serious questions about whether building code was followed. 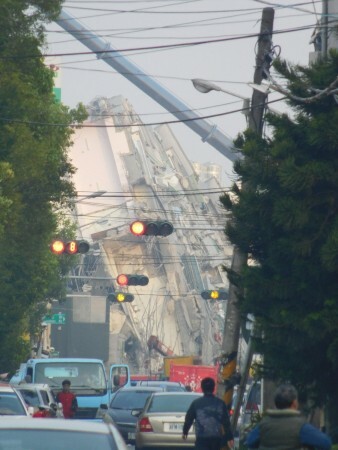 The big one—which you probably saw on TV laying across a large street 15 minutes from where I live—was 20 years old. This will get really interesting. So, this time, the lesson is not about whether God is good for His well-disguised blessings, but that it’s really important to not cut corners. 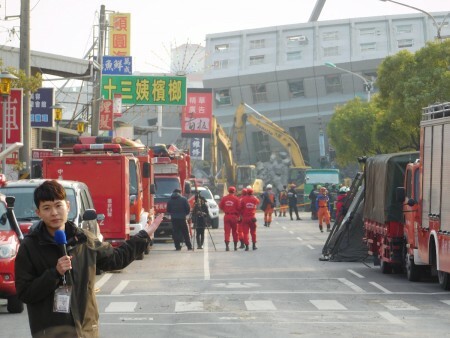 A year ago, in Kaohsiung, the same city as where Saturday’s epicenter was, a propylene line blew up killing 300 people. 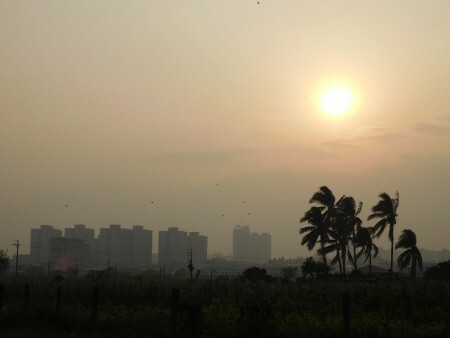 The problem is reported to have been traced back to construction 20 years ago with some dubious procedure violations. Corners seem to have been cut in the paperwork and a pipe was left exposed to oxidation. When propylene pressure dropped, rather than asking why, the “receiving” company reportedly demanded to have the pressure turned up. 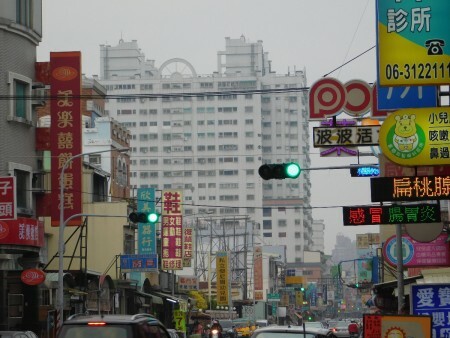 Involved companies were affiliated with the same political party that controlled Kaohsiung when the dubious activity was said to have happened. A lot of problems are being traced back 20 years. 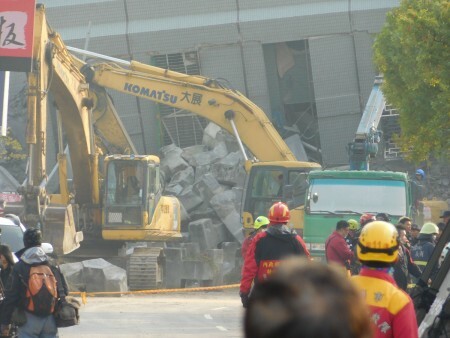 This same party (and its masked affiliates) had power in many places, even during the construction of a building that fell onto Yongda Road, Saturday at 4:00am in Tainan, Kaohsiung’s “twin city”. It is Chiang Kai-Sheck’s “Nationalist” Kuomingtan (KMT) party, which fled the Communists in 1949, declared martial law, slaughtered 20,000 Taiwanese, outlawed the local language, and, more recently, lost both the legislature and the presidency in the election not three weeks ago. It is a party that owns for-profit assets, even on paper, and has angered free-seeking Taiwanese, who fled the mainland long before the Nationalists arrived, like the Pilgrims fled Feudalist Europe. One of the winning party’s promises was to make it illegal for a political party to own financial profitable assets. There are many larger and taller buildings that did not fall over. These that fell were not closest to the epicenter. 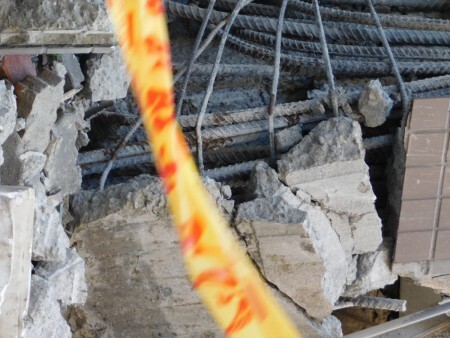 There could have been seismic changes underground that made the buildings unknowingly unstable, but there are systems in place to watch for signs like that. The word isn’t out yet, but I’m waiting for some architect to ask that someone be indited. 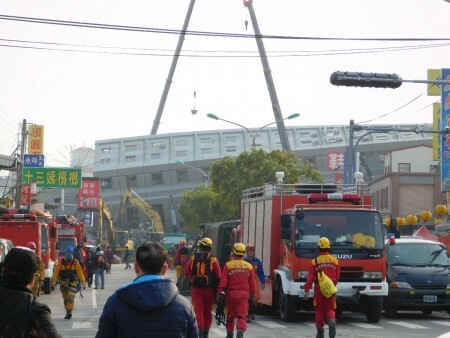 One of the many scandals KMT-Nationalists have been caught up in is over the construction of the Taipei Dome. You can do your own research on the stadium whose walls were almost complete before the foundation was finished. I won’t say more about Taiwanese politics than that Richard Bush and the American government have spoken favorably of the party during elections, that students took over their legislature over seemingly “pro-China” policies, and that no catastrophe occurs in Taiwan without politics involved, not even with sending aid in the recent dengue outbreak in anti-KMT voting regions. Politics are bound to come up as they always do—and they always do. This time is no exception. As for the emergency response, it was in full swing. The Taiwanese wasted no time. 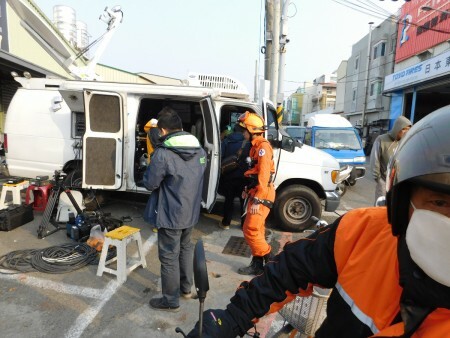 Rescue workers were on the ground, some even from New Taipei (from the far northern end of the island). Police were there. Men braver than I wore hard hats and repelling gear. At the sight, some people were still in shock, even 12 hours afterwards. Dust congregates to one side of the wreckage, where depending on the direction of the wind. Police watch crossroads as in any emergency zone. The press lined up. I refused to get close enough to interfere. That’s one thing telephoto lenses are useful for. But there were two other things that go largely unreported, which I couldn’t help but notice. The first is logistics. The second is national spirit. Few things can happen in Taiwan without China’s reminder of almost 2,000 missiles aimed at the peaceful island, like devils ready to pounce on a Holy angel—if only they could. Since the “pro-alliance” candidate was elected president, as opposed to the de facto “pro-unification” aspirations of the previous regime, China has been watching closely. The Taiwanese are no enemy of China for their part. Between the barrels of Chairman Mao Zedong’s powerful guns and the Taiwanese democracy that occupied its own legislature three weeks in 2014, the common enemy, Kai-Sheck’s KMT-Nationalists, were finally defeated in January’s election. But few want to record the 2016 election as a mutual victory between rivals. From Beijing’s view, invasion is NOT off the table if Taiwan seeks to declare friendship with China rather than absorption… At least is wasn’t off the table. Yongda Road is strategic. 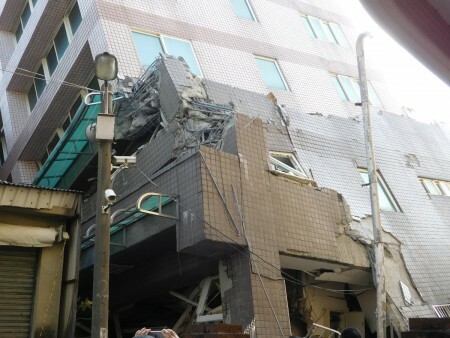 Another building damaged in the earthquake was an office building that was empty at the time. No one was hurt. It leans 70° over another main road, now covered in dirt, soon to be covered in demolition. And, the two roads intercept. From a Taiwanese military vantage point, these two roads—and the junctions they watch—have been made more defensible. This only involves the two buildings I visited. There are many more. If you want to invade a country, roads matter. And, Tainan has the most preferable beach, but not for another few months, not with the main veins guarding the deeper territories being partially shut-down. It’s almost like the scene from Fahrenheit 451 where the main character falls down in the middle of a street and unintentionally saves his own life in doing so. 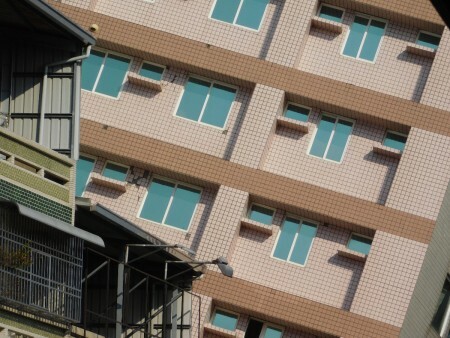 While I won’t put too much stock in my land strategy theory, China needs the Taiwanese to repair these buildings because only the Taiwanese understand their own infrastructure well enough to. Until then, as much as Communists don’t like to admit that they need anything at all—especially someone else’s well-being—Beijing needs Taiwan’s government to continue to function without interruption. The other, and less speculative, factor is national spirit. The Taiwanese are a “nation”. 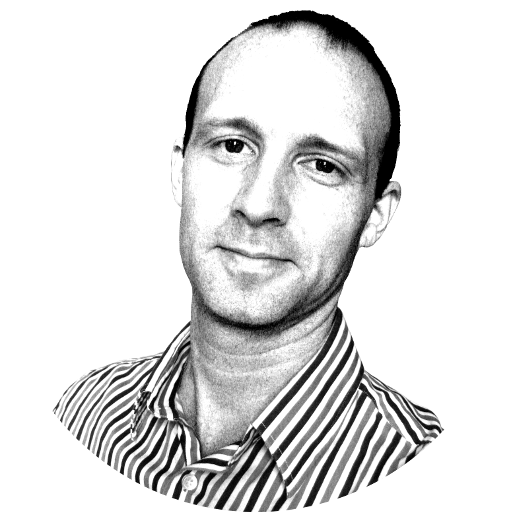 They are a people group with a language, culture, worldview, ethnicity, and distinct history. 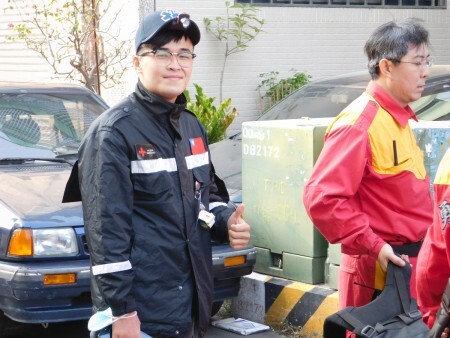 And, with the frequent catastrophes that the Taiwanese continue to endure, locals are getting quite efficient—and quite strong—in dealing with disruptions. In addition to each home being an earthquake-proof bomb shelter, every home has a water tank that can supply a normal household about 5 days. So, the Tainan water supply being interrupted didn’t really matter. And, on Facebook, even high school rivals posted information helping each other know where to get more water if anyone should run out. Malcolm Gladwell, in his recent David and Goliath, elaborates on the “superman” complex that developed among Londinians during Germany’s bombing blitz. In a city of 8 million, “only” 40,000 were killed. Everyone else started thinking themselves invincible. When you hear a building fall down right next to your home at 4:00am, and you aren’t dead, you tend to develop a spirit that you can survive anything. 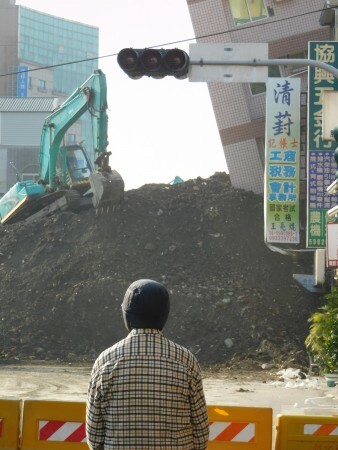 When you look at the end of the street where you went to school as a kid and you see a collapsed building where a blue sky should stand, what should you think other than, “I lived!” It doesn’t matter if the building fell during an earthquake or a bombing run. When we don’t die, when we could have died, our spirits tend to get stronger by numbers that require powers of ten. Short of the unspeakable, there are always more survivers than casualties. Survivors tend to become unbreakable. Germany’s Blitzkrieg didn’t exactly work in Germany’s favor, if the goal was to break the British spirit. The Britons have had many well-disguised blessings. As with politics, Taiwan is no exception.